The James Webb Space Telescope (pictured here during a mirror inspection) will enhance Hubble's observations in many areas, but it lacks in ultraviolet capabilities. 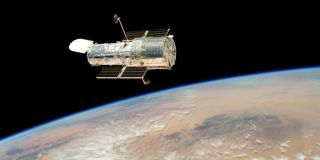 Hubble's ultraviolet capabilities are not replicated in any telescope now, or in the near future. Here, possible water plumes on Europa (disclosed earlier this year) are imaged using Hubble's ultraviolet filters. An artist's concept of the Habitable Exoplanet Imaging Mission, which is still on the drawing board and not approved for funding. This is a possible successor to some of Hubble's capabilities, on top of the current James Webb Space Telescope.